The all-aluminium Fast Displacement motoryacht (formerly Project Nova) launched on Friday 14 April. 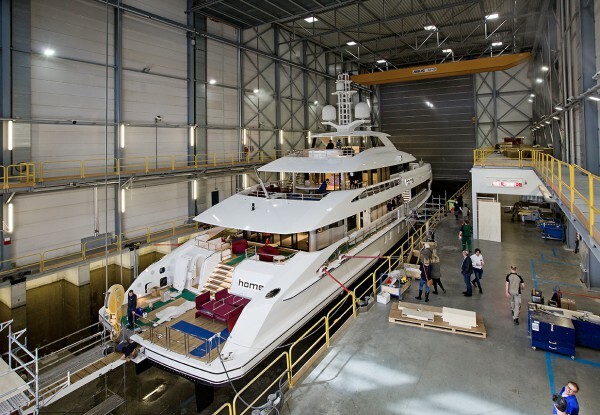 Below the 500GT threshold with eye-catching exterior styling by Omega Architects and naval architecture by van Oossanen, she draws on hybrid propulsion for fuel efficiency and quieter cruising rather than higher displacement speeds, as in the case of previous FDHF yachts by Heesen. Fitted with relatively small engines MTU 12V 2000 M61 diesel engines of 600 kW each and two water-cooled DC electric shaft motors of 127 kW each, Home burns 98 litres of fuel per hour at 12 knots for a cruising range of 3,750nm. Using her generators alone, the yacht can cruise at up to 9 knots, at which speed her consumption is predicted to be just 45 litres per hour. The shaft motors can also be used as generators to service the hotel loads, with a consequent saving in fuel. In boost mode (main engines plus the shaft motors) the yacht has a top speed in excess of 17 knots. Although battery banks for propulsion were dismissed from the beginning, her hybrid propulsion also offers the prospect of quieter cruising. 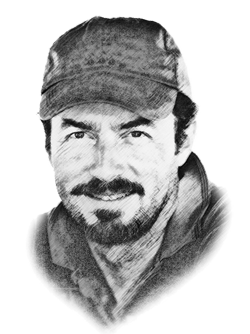 In fact, at 9 knots in hybrid mode predicted sound levels in the owner’s stateroom are a hushed 46 dB(A) and 50 dB(A) in the main salon. Her European owner chose Italian designer Cristiano Gatto for the interior design after seeing his work aboard M/Y Loyalty (ex-Project Akoya) launched last year. Based on brushed spruce, grey-stained walnut and dark Japanese Koto wood, the joinery is in crisp contrast to the predominantly white walls and furnishings. Home features a master stateroom on the forward main deck, and a full-beam VIP suite and four guest cabins on the lower deck, with a dedicated gym on the same deck level. Floor-to-ceiling glazing on the main and upper decks ensures plenty of natural light. Instead of a transom garage and beach club, there is a fixed swim platform with a dayhead in the lazarette, while the MOB and guest tender are stowed on the foredeck. Thanks to the plumb bow, there is also a very spacious below-deck locker for other toys. 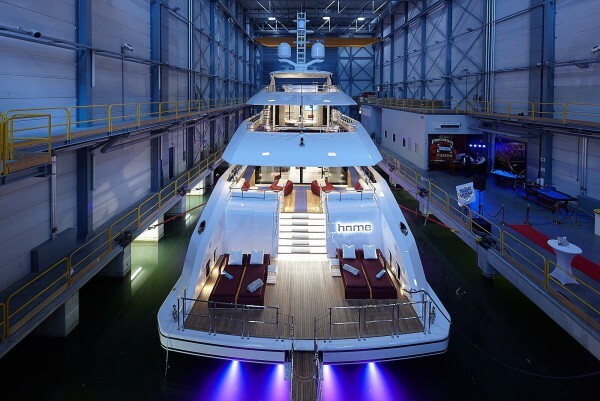 ‘Home’ is an appropriate name for a yacht that will be used as a second home on the water by her owner, who intends spending extended periods on board and has allotted office space for his PA. 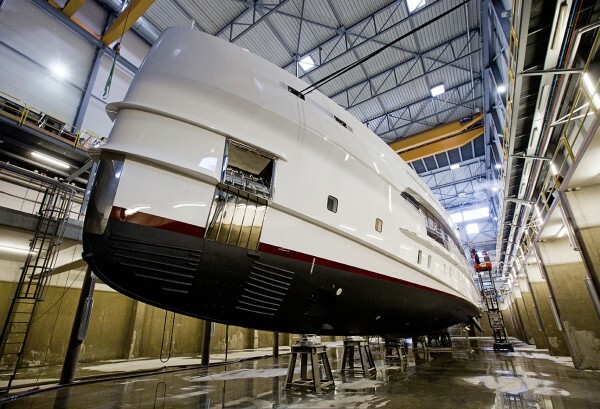 Started on spec, the project was sold in June 2016 by Thom Conboy, Heesen’s director of sales for the Americas. After completing her fitting out, Home will undergo sea trails in the North Sea and following delivery in June she will depart for Scandinavian waters and then the Mediterranean. At the end of the summer season she is expected to transit the Atlantic bound for the Caribbean, Central America and the US.